Everyone cares about his/her system's security and cares more when its related to virus. Here comes one new enhancement in security perspective in Windows 10 November updates and that's about Windows Defender. Its now more integrated with Windows Operating system. We all know Windows defender is already present from Windows 7 on wards. Lets see what Windows November update has added more to Windows Defender. 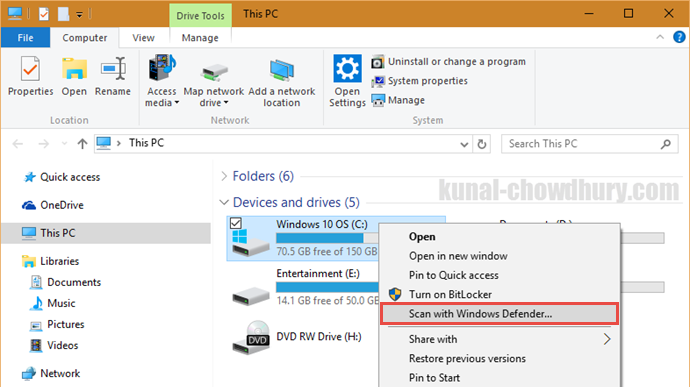 Previously to scan a particular drive, file or folder using Windows Defender, we had to open it first. Then we had to select the specific drive or folder before starting the scan. Now Windows 10 November update has added more user friendly functionality to it which now has become tightly integrated with the system. I hope this post was helpful. Don't forget to check other blog posts on Windows 10 Tips and Tricks available in this page: http://win10tips.kunal-chowdhury.com. Subscribe to my blog's RSS feed and email newsletter to get the latest post updates. Also connect with me on Twitter, Facebook and Google+ to get the link updates that I share over those social networking sites. If you have come this far, it means that you liked what you are reading (#Windows10 November Update: #Windows Defender context scan).